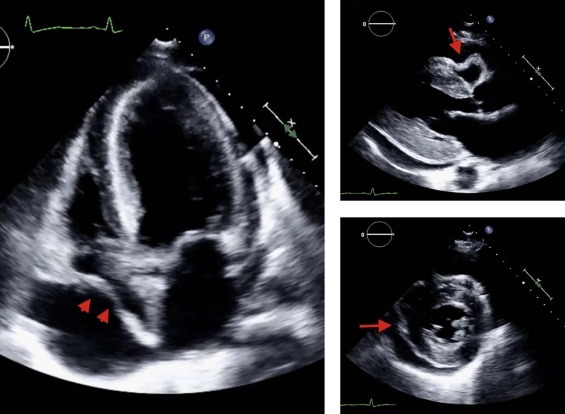 Transthoracic echocardiogram views revealing collapse of the right atrium during atrial diastole (red arrowheads) and of the right ventricle during ventricular diastole (red arrows). A 55-year-old Ghanaian man was admitted to our service with 4 days of acute, progressive dyspnea. He developed orthopnea the night prior to his admission. Review of systems revealed progressive asthenia, anorexia, and low-grade fever for the past few months, with an unintentional weight loss of approximately 40 lbs. No other symptoms were elicited. The patient’s physical examination was within normal limits, except for mild periorbital edema. Cardiac sounds were unremarkable, and there were no signs of volume overload or circulatory abnormalities. Initial work-up revealed leukopenia; normocytic, normochromic anemia; and elevated erythrocyte sedimentation rate. He had decreased renal function and subnephrotic proteinuria (urine albumin-creatinine ratio 1232 mg/g). His electrocardiogram was unremarkable; his chest x-ray study revealed cardiomegaly. A bedside transthoracic echocardiogram on admission revealed a moderate pericardial effusion, without diastolic collapse. The differential diagnosis included autoimmune diseases, malignancy, and tuberculosis—in light of the above findings. A repeat echocardiogram was obtained 24 hours after admission (Figure), showing progression of the effusion and partial diastolic collapse of the right atrium and ventricle. The patient was transferred to the intensive care unit and a pericardial window with biopsy was scheduled for the following morning. Approximately 12 hours later, the patient developed dyspnea at rest and pulsus paradoxus, and was operated on urgently due to probable pericardial tamponade. Further work-up later revealed antinuclear antibody titers of 1:1280, with a speckled pattern, anti-Smith antibodies of > 8 AI, and C3 levels of 70 mg/dL. He had negative titers for rheumatoid factor, and antibodies against ribonucleoprotein, double-stranded DNA, and cytoplasmic and perinuclear antineutrophil cytoplasmic antibodies. The diagnosis of systemic lupus erythematosus was established once serology became available, based on serositis, renal affectation, leukopenia, anti-Smith antibodies, and low C3. The pericardial biopsy was consistent with lupus pericarditis, and malignancy and tuberculosis were ruled out. This is a rare presentation of a new case of systemic lupus erythematosus. It illustrates the impact of racial influence on disease manifestations, and the clinician’s need to have a broad differential diagnosis.